Trying to get to Arafura ! Two golds for Nei (Ms.) Tekariti in Dubai ! Two to attend Jumps course in Fiji 2016. The KAA in USA for the first time ! Teebwaki in the Gold Coast Asics Half-Marathon. The new KAA Executive for 2014 - 15. TE RUNGA (Inter-Island Games) 2013. First ever I-Kiribati DECATHLETE ! Off to Moscow - and the result ! Utiraoi off to Ukraine and RESULT. Delayed World Athletics Day 2013. Possible Involvement in Masters' events ? Top people in London Olympics. Welcome Party on July 25th. Days 2 and 3 at CAIRNS. Images from World Athletics Day. Part 3. Images from World Athletics Day. Part 2. Images from World Athletics Day. Part 1. Yvonne finally gets to Kiribati ! Aiming for Cairns in June. The Executive Committee for 2012-13. Two from KAA to WIC 2012 in Istanbul. Mr. Nooa Taakoa and Ms. Etita Tio have been entered for the 60m. sprint at the World Indoor Championships, and they are accompanied by Mr. Eneree Tataio as coach. KAA Championship is coming up on Friday the 18th and Saturday the 19th of November 2011. In a recent course (completed Oct. 02, 2011) KAA gained one more Level 3 Coach. Two athletes travelled with the Kiribati team to Noumea, New Caledonia, for the Pacific Games 2011. As usual, two sprinters were selected to compete for Kiribati in the World Championships. KAA was represented at the World Youth Championships in Lille, France. First venture into Oceania West ! KAA maintained its reputation of getting medals at sub-Regional level. End of an era - probably ! The Secretary of Kiribati Athletics Association, David Little, has returned to U.K. after 14 years of living, teaching, coaching, and helping generally in Kiribati. Long-distance - for a few ! Three silvers, one bronze, and one NR in Cairns. Inter-School Results from July 7 - 9 2010. Elected to the KAA Executive. Problem for the Secretary ! PB for George in Doha. George off to the Desert ! And then ONE came ! Even with only one in each race, it was worth staging them ! Uninterrupted Pentathlon - well, nearly ! Only Kaitinano on the final day ! Raobu smashes his own NR. First up for Kiribati ! Joyce in her first international ! ZERO TOLERANCE - a mistake ? National Record for Kiakia in M400. More happiness on Day 2 of MAC ! Micro success on Day 1 on Gold Coast. ANOTHER N.R. - This one was hiding ! Three National records in the Inter-School ! Personal best for Uaati in Italy ! A struggle to hold our Championships - but we finished ! World Athletics Day 2 2009 - and no clashes ! World Athletics Day 1. 2009. The BURST has continued ! A burst of activity ! Trials 2 - in preparation phase ! Final Trials 2008 - or that was the idea ! Must we start again ? The International Calendar - a bit of a mess ! It's all gone quiet ! While they were here ! And the Womens' results ! Te Runga - detailed results. Safely home - and eventually with baggage ! The travel experiences mount up - why only half (8) of the bags reached Brisbane with the group ! Two days later the rest caught up ! When will the problems end ? In Fiji - heading for Pune. KCY Competition - and some results. Catholic Youth - on holiday - and running ? What ! Kaitinano not there ??? We still had Trials 7 - a week late ! Struggling to reach Beijing ! Conducive to training ? Well maybe ! Training for Pune - the regime starts ! Less able - but so keen ! Comment on Inter-School Day 2. Recalling the Opening Ceremony in Saipan. An uneventful journey home ? And on Day 3 in Saipan ! So near, so far ! Another piece of history ! Grand Prix Day 2 - three more PBs ! First PB - after only four hours sleep ! Preparing for departure to Saipan. Local medicines - are there WADA tests ? Running out of space ! Saipan first, then Beijing ! Day 2 Results and more images ! The story of Day 1. 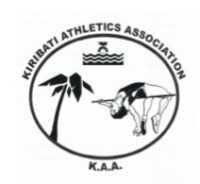 World Athletics Days in Kiribati. Part 1. Top school gets into gear ! Bonea putting himself forward ! Bound for Pune - David jumping for Joy ! A new training for Pole Vault ! St. Louis results (winners) and photos. Top school domestic + old boys ! Trials 3 - Planets and little stars ! Our first Pole Vaulter ? Maybe ! A little piece of History ! How will he fare in Valencia ? Back to the grind-stone ! The F4 beach run winners - and Tonika ! More on the rising stars. This was a Fun Run ??? Junior (Tunia) is BACK ! Rabangaki off to Valencia ! New Qualification for Olympics from 2012 ? At least one medal each ! ...And here we are in Majuro ! Whisper it ! We're going to Guam ! New angle on Shot Putt ? Limited numbers but fair quality ! Faster (?) and higher ! Getting ready for MAC in Guam. Registering with Oceania Athletics Coaches Assocn. The new A.D.O. for Micronesia. Only four came back ! Home at last - and "Thanks, Minister !" Can any country beat TEN ? Kaitinano the best on Day 3. Two more for the record ! Opening of SPG 2007 ! Cairns-bound for the Grand Prix ! Up-date ! This is only the first of four !! An almost-complete Squad meeting has crystallised our thinking ! Back to a Trials format. Day 1. and other excitements ! One competition too late ! A close contest - but St. Louis victorious again ! Inter-School Day 1 - a rescue from disaster ! Our first 40m. Intermediate ! On the podium in Nauru. Olympic Day Run in Nauru. Six Kiribati NRs on Day 2 ! Helping to decide the future of sport in Kiribati. Tri-Rigger .....or only Bi-Rigger ?! MAY TRIALS - some steps forward ! National Record on Day 2. More clashes for the Nationals ! PLEASE Read the OACA Newsletter ! Thanks for the up-grade ! St. Louis 2007 Champs. Days 1. and 2. We met the deadline - did you ? New (Acting) President for OACA ! March Trials - Field only ! Why are they strong ? Celebrating three score and ten ! February Trials - why so inactive ? No saga this time - we hope ! MICRONESIA on the MOVE ! - AND HOW ! ...and there HE was at breakfast ! UP-DATE ! We're off to meet Lamine ! Marakei Pole Vault boys ! Level 5 Director of Coach Development. Taking the gospel to the outer islands ! We've started Pole Vault - have you ? KAA Results Round-up from Fiji / Samoa. Please check Docs and Records. The Apia Saga concludes ! Well nearly ! A Micronesia analysis from Samoa. One had to stay behind ! Gold in the Disabled Games ! Good luck in Fiji and Samoa ! Moving the office. Part 2. Action from the Catholic Sports. Thank you to our readers ! Moving Office - part 1. Some tug but no war ! Rabangaki clinches a place ! Having to move (house x) office ! We did it - more or less ! Two to the Grand Prix - again ! World Athletics Day 2006 - up-date ! Washed out - but wait and see ! Four hours of noise, action and sun ! Trials 9 - Sprinters and Shot. Training in the rain ! Communication seems difficult - but slowly the squad numbers build ! Life after "Te Runga" ! A microcosm of life ! Thanks - to all concerned ! We wish to thank everyone associated with our invaluable Olympic experiences in Athens. Almost all the vibes were positive and we are still catching the echoes ! The letter from the Netherlands.